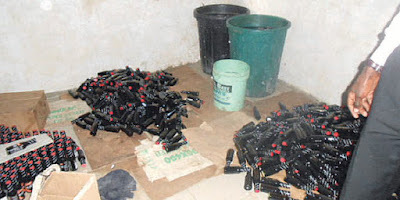 The National Agency for Food and Drug Administration and Control, NAFDAC,has uncovered an illegal factory within the Trade Fair Complex in Lagos loaded with various expired food condiments worth millions of Naira even as it arrested a 24 – year- old, Mr. Victor Ebuka Okeke in connection with the expired products. This was sequel to a special raid and enforcement operation in some markets in the metropolis by officers of the Investigation and Enforcement Directorate of the Agency. The factory which was originally a one- room shop was used to stock, re-validate and distribute expired products, particularly, food condiments. Some of the expired products discovered in the unhygienic factory include expired Maggi Sauce with manufacturing dates: 15/08/2011 and expiry dates: 15/08/2014, Amoy Dark Soy Sauce, Costa Corned Beef and Exeter Corned beef among others. For the Costa Corned Beef, whether expired or not, the 24-year -old suspect,changed their labels to Exeter Corned Beef,which according to him, was to attract patronage to the Costa corned beef because it was a fast moving brand than the name Costa in the market. He revealed that the suspect, who also claimed to be the managing director of the factory, was caught re-validating the expiry dates of Maggi Arome sauce and Amoy Soy sauce smuggled into the country from Ghana from expiry dates of 2014 to August 2016. Mohammed who said the suspect had refused to give useful information regarding the whereabouts of over 902 cartons of expired MAGGI sauce already pushed into the market said the agency will be charging him to court for counterfeiting offences. Lamenting that most of the re-validated products have been pushed into the market for unsuspecting consumers to buy, he said consuming such products could lead to terminal diseases such as liver and kidney diseases which are currently on the rise in the country. He further explained that the sauces are sodium- based products that could lead to hypertension if consumed. Fielding questions from journalists, the suspect, Mr Victor Ebuka Okeke who claimed to hail from Njikoka in Anambra State, said he was forced to re-validate the dates in order to recover the money he spent in importing the products. It could be recalled that the Agency in its determination to ensure stringent punishment for counterfeiters is currently reviewing its laws, with a view to making convicted counterfeiters of drug and food products spend the rest of their lives in jail. The Director-General of NAFDAC, Dr. Paul Orhii, had disclosed that the current law which stipulates a fine of N500,000 or 15-year jail term upon conviction, was inadequate. He stated that the new law sought life jail term and confiscation of assets upon conviction, compensation for victims where the counterfeit product was found to be the proximate cause of severe bodily injury. Orhii said the new law would also make counterfeiting a non-bail-able offence, adding that a whistle-blower clause was also included in the new .